You will not be surprised to learn that in the years since 1927, there have been many calls on our expertise to replace torn tails, ears, lost eyes etc to well worn and loved animals. As well as repairs, we can re-stain and re-wax your animal giving it a whole new lease of life-fit for another 30 years companionship! We love to see “Old Friends” and return them to their families in a better state of health. The cost of a basic re stain and wax polish varies between £50 – £100 + VAT depending upon the size of the animal. This cost EXCLUDES the cost of postage. Should your animal require more extensive repairs, it is very helpful if you can send through photos of the damaged areas. We will assess what work is needed/possible and provide a quote by email. Alternatively, you can purchase materials to re-stain and wax polish your animal with our care products. Pack your animal carefully in a box and send it to us at the postal address given under contacts. Please include a letter with your name, address and contact telephone number and an idea of what you would like doing to your animal. We will contact you to confirm what we are able to do and a quote for the work. You can contact us before sending to get a idea of the cost of repair but please note that this will only be a estimate – it is often difficult to tell until we see the animal. No work will take place until approval is given and please allow 6-8 weeks for the work to be done. After settlement of the account, we will return the animal to you! Keep your animal out of direct sunlight and or direct heat. The sunlight will fade the stain and heat will dry out the leather and cause it to become brittle. Keep your animal dry and away from water. We use a water-soluble stain on our animals and this can be damaged by direct contact with water. Dust and wax your animal on a regular basis. The animal should be polished with a good quality wax polish. DO NOT USE any spray or liquid polish. These types of polish contain chemicals, which damage the water-soluble stain. We use “Nikwax Waterproofing Wax” which can be purchased from our Online shop or hiking shops. The wax is used for waterproofing walking boots etc. Any similar product will do. In the early life of your animal apply wax monthly – this will help seal in the stain and minimize water damage. Warm the wax slightly so it is soft and apply to the animal with a soft cloth. Leave to dry and buff up to a shine. Thereafter, apply wax on occasion to keep the leather in good condition. Note: the stain supplied is a water based, permanent stain. Spillages can be mopped up with warm water and a cloth but colour damage cannot be removed easily. 1. Cover a flat service with several layers of newspaper. 2. Wear household gloves to protect hands against stain and an apron to protect clothing. 3. Work in a well ventilated room with good lighting. 4. Obtain sponge/piece of old cotton T shirt material to apply stain. 5. Dispense a small amount of stain in to a container large enough for you to dip your sponge/cloth in to. Place your animal on the flat service covered with newspaper. Turn him onto his back. Dip sponge/cloth into stain solution and squeeze out any excess stain. Move sponge over surface of leather using SMALL overlapping CIRCULAR movements, starting with the underbelly and inside of legs. DO NOT apply the stain using long wiping movements as this does not give a nice finish. Complete sides of body overlapping the stain as you apply it, finishing off with the head. Leave animal overnight to dry off. 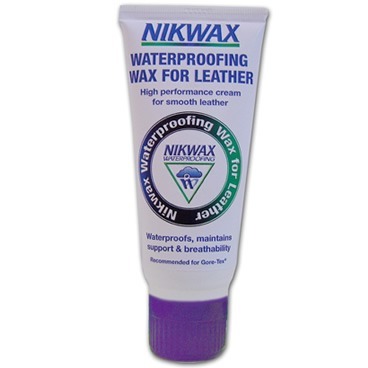 Nikwax is a water based wax that is absorbed into the leather (as opposed to sitting on the top of the leather). It is used to waterproof leather and provide protection from drying out. It is GREAT for your keeping your animal in good condition.1) Apply Nikwax in the same manner as the stain, using a fresh sponge/piece of cloth. Work in small circular movements. The Nikwax may “lift off” some of the stain. This is not unexpected and gives the “antique effect” finish that we look for. Thread up long needle with string provided and pass needle through punched hole on stem of eye. Undo string from needle. Pass both ends of string through eye of needle. Push needle through right hand eye hole and come out through opposite eye hole. Pull on string to tighten the eye into eye hole gently pushing leather stem on back of eye into hole with small screwdriver. De thread needle on opposite side. Attach one end of string to second eye (through punched hole on stem). Tie string to eye stem leaving a tail end of approx 2 inches. Once both eyes are firmly in place, tie off loose end of string against 2”tail end of the first piece. Trim ends (leaving approx 2 inches) and push excess string with a small screwdriver gently in to back of eye hole. NOTE: if the eyes have worked their way loose and have not actually fallen out, you need to find the 2 ends of string attached to the eye on the LHS (facing the animal). It is most likely the knot has worked its way loose. You simply need to find the ends of string and pull on them to bring the eyes back in to position. NOTE: if do not have a long needle, suggested options are – a BBQ meat skewer, piece of stiff wire with end bent over (to make the eye), perhaps a knitting needle if can tie string around one end without it coming off!